In this tutorial I’ll show how to enable only the specific cells of a grid to be editable. First I’ll prepare some demonstration data. It will be a list of materials and their maintenance status. If status is set to ‘A’ we would like to disable editing of status in the grid. Now we create a function group with screen (i.e. 0200) where we’ll draw our ALV grid. In the screen layout editor create a custom container and name it i.e. GO_GRID_CONTAINER. *   We have to mark all required columns as editable !!! READ TABLE gt_fieldcat ASSIGNING <fs_fcat> WITH KEY fieldname = 'PSTAT'. gr_grid->register_edit_event( i_event_id = cl_gui_alv_grid=>mc_evt_enter ). <fs_data> LIKE LINE OF gt_data. WHEN 'BACK' OR 'LEAVE' OR 'CANCEL'. LOOP AT gt_data ASSIGNING <fs_data> WHERE matnr IS NOT INITIAL. INSERT l_lvc_styl INTO TABLE <fs_data>-cell_styles. 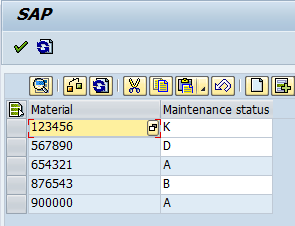 This entry was posted in ABAP, ALV, ALV tutorial, Development, Dynpro and tagged ABAP, CL_GUI_ALV_GRID, CL_GUI_CUSTOM_CONTAINER, LVC_FIELDCATALOG_MERGE, LVC_S_STYL, LVC_T_STYL, MC_EVT_ENTER, MC_STYLE_DISABLED, REGISTER_EDIT_EVENT by Spider. Bookmark the permalink. In this case, only one column is editable, how can we edit more columns ? Found, just have to duplicate the corresponding lines. READ TABLE gt_fieldcat ASSIGNING WITH KEY fieldname = ‘PSTAT1’. 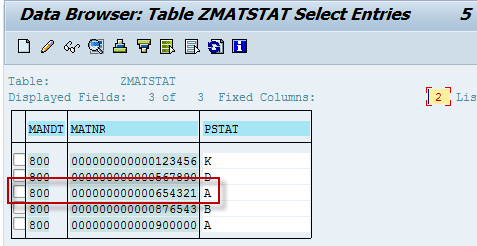 READ TABLE gt_fieldcat ASSIGNING WITH KEY fieldname = ‘PSTAT2’. * We have to mark all required columns as editable !!! 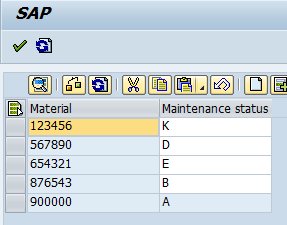 READ TABLE gt_fieldcat ASSIGNING WITH KEY fieldname = ‘PSTAT’. …so if you want to make another column editable, just modify the corresponding field in your field catalog similarly to the code mentioned above.